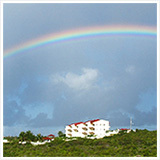 Most people know the Anguilla ferry as "the last leg of a long journey" or "the way to get to and from St. Martin." But it's really much more than that. If you watch the people who live on Anguilla, it's a social mini-event, too. I told my Dad about that, how friends meet each other and chat. The first interesting intersection was the trip to Anguilla my Dad and sister took to buy Anguilla real estate, just after we had returned from Italy. They landed in St. Martin and hopped on the Anguilla ferry. They met two women from Milan, Italy. The entire upper deck was from Italy, the country they were in 72 hours ago! 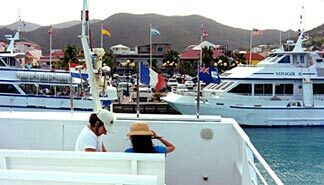 On another occasion, we were heading to St. Martin from Anguilla. 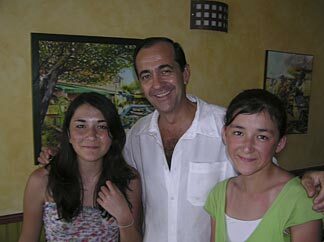 At that time, we were staying at Tortue Villa, which is run by Sam Mason. My Dad started to talk with one of the men sitting next to him. It turns out that this particular Anguillian had travelled from coast to coast in Canada... in the winter! Needless to say, they were soon engaged in rollicking, laughing conversation. After all, Anguillians put on their winter parkas when they approach freezers! Before he knew it, the boat had come to a halt. As they shook hands, my Dad asked his name. Lo and behold, he was the brother of Sam Mason. He had just returned to the island, and not even Sam knew he was back yet. The Anguilla ferry can certainly bring people together! 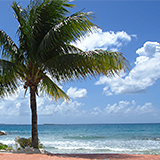 A Day Trip to St. Martin! Somehow a vacation to Anguilla always feels incomplete if we don't ride across the Caribbean channel to the "French Riviera." Shopping to Burn Them Off! Here we are at the Tropicana with Christophe, one of the owners of Tropicana. A fun and funny man, he always gives us a chance to practice our French. And his fries are out of this world. 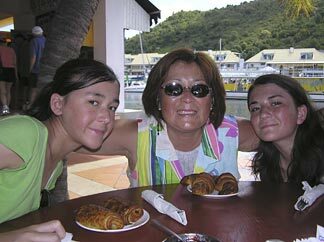 All of that... croissants, clothes, salads, fries and friends on the simple Anguilla ferry! 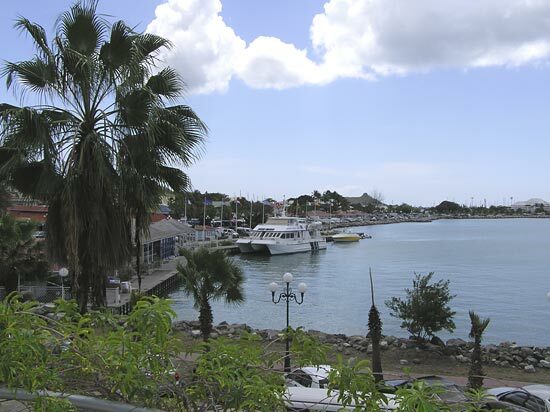 Whether it's the "last leg of the oh-so-long journey to Anguilla", "a great way to meet people," or a day trip to St. Martin, you can't beat the Anguilla ferry!